Internationally known genealogist Tony Burroughs and immediate past president of the National Genealogical Society, Jan Alpert, will present the latest research methods and information sources in fast-changing the field of genealogy. The two-day event also will feature many other speakers, both national and state, who will provide attendees with the tools needed to successfully trace families. My new sister-in-law never knew her grandmother. All she knew was a first name - Mabel. Mabel had a son (the father of my sister-in-law) who she gave up for adoption in 1914 and all the family knew was that she worked for a wealthy family in London England. As a surprise for my sister-in-law I've been researching her family for the past year. I started with her dad's birth certificate from PRO, which didn't reveal his father's name but gave me more information about Mabel. Using that plus a marriage record, I was able to trace Mabel and her family back several generations. But all I could find on Mabel was that she never married and died in 1977. So I began tracing Mabel's siblings - one brother and one sister. The sister died young but her brother married, had one son and that son had four children. I told my sister-in-law that if she wanted I would try to find and contact the four children (they would be her cousins) but she should be prepared for reactions ranging from overjoyed to know of new family to refusal to acknowledge her. Long story short, I follow various genealogy forums online. In order to know when new posts are made to certain forums, I make sure I post responses to others queries. That way I get an email when anyone posts on that topic. I also post queries. Two days ago I received an email notification that a man had posted in a forum I watch where the topic is Mabel's surname. I was blown away by this new post. Someone had posted looking for information on his grandfather - Mable's brother! I wrote to him privately and told him about Mabel and her son. I wasn't sure if he would respond or if the family knew about Mabel's son. But I got lucky. He responded with "this is a bombshell but I'm overjoyed"
In an exchange of emails I have learned that he knew his "Aunt Mabel" very well and that he visited her frequently until her death. He's now filled me in on many details of Mabel's life and personality. She was well-loved by her family but no one alive now knew of her son. Ironically she lived less than 11 miles from her son when he was an adult. It is so sad that he never got to meet her but my sister-in-law is thrilled to find out about her mysterious grandmother. Best of all, my new contact is in the process of asking his mother for photos of Mabel. Had I not been watching this particular surname forum it's unlikely I'd have found Mable's nephew. Serendipity at work! 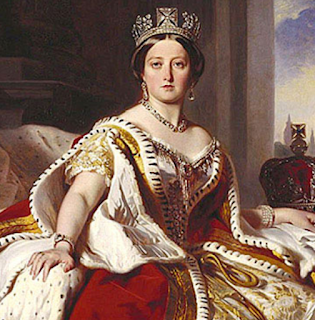 In celebration of her Diamond Jubilee, and of Queen Victoria's birthday on 24 May, Queen Elizabeth II has made the journals of Queen Victoria available to the public. The journals provide a picture of Queen Victoria's life from the first entry in 1832 at the age of 13 until 10 days before her death aged 81 in 1901. This is an ongoing project and journal entries will continue to be transcribed. This is such an odd story that I felt compelled to share it. A 13 year old boy bought a camera at a garage sale. He got it home and opened it to find a photo of his uncle who'd been killed several years before. The family who owned the camera have no known connection to the boy or his uncle. Okay maybe it's just me but I think this is the cutest card ever! It might be a bit young for my son who has a 30-something birthday coming up very soon, but I liked it enough to buy it anyway. I wish there were more genealogy themed cards available. I realize I could make one myself but I like store-bought ones. And I like ones I can send and get via mail the old-fashioned way, not a digital card. I'm not fussy, I just know what I like! I prefer a card I can save. And I save far too many! I have many dozens in my Genealogy Treasures Blanket Box. How about you? Are you totally into digital? Or do you like the look and feel of one you get in the mail? Our digital library now includes all 27 portions of the Brewster Collection donated by Miss Emma C. Brewster Jones in 1908. This genealogical material on the descendants of Elder William Brewster, passenger on the Mayflower, contains extensive material on lines of descent through female Brewster family members. The new material in the digital library is particularly exciting as it contains material on the female lines; none of this was included in her two-volume Brewster Genealogy published in 1907. Surnames listed include: Bartlett, Christophers, Coolidge, Freeman, Fosdick, Knowles, Mayo, Paine, Pickett, Prence, Prince, Starr, Turner, and Wetherell. Members will be interested to know that the NYG&B acquired the Brewster Collection almost 100 years ago, and a description was published in The New York Genealogical and Biographical Record, (Vol. 044, No.3). Click here for a complete breakdown of the volumes and chapters within this collection. The halfway point for indexing the 1940 U.S. census is fast approaching. Congratulations and thank you to all of the volunteers participating in this unprecedented genealogical community effort. Currently more than 20 states are at or above 85 percent complete. Six states—Delaware, Colorado, Kansas, Oregon, Virginia, and New Hampshire—are now indexed and searchable by name, location, and family relations. And thanks to the efforts of more than 100,000 volunteers, more states will be added in the coming weeks. Follow the day-to-day indexing status at the1940census.com dashboard and search completed states at familysearch.org/1940census. To view a list of currently available indexing projects, along with their record language and completion percentage, visit the FamilySearch indexing updates page. To learn more about individual projects, view the FamilySearch projects page. View the FamilySearch projects page to see the full list of available projects and to learn more about how to participate in various projects. 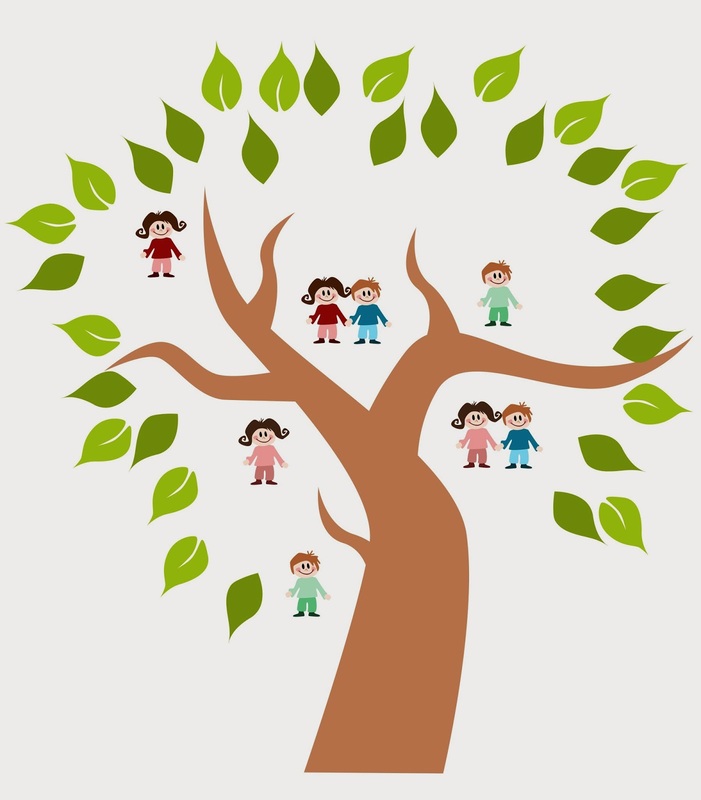 Olive Tree Genealogy is very pleased to present an article by Guest Author Marie Rundquist. Marie's books (listed at end of article) are available at buybooksontheweb.com (Infinity Publishing), Barnes and Noble, along with other Internet and E-book sources. At Memorial Day events and backyard barbecues, we cherish the memories of our beloved men and women in uniform, share their treasured photographs, and display their medals of honor, but what do we really know of their stories? As time passes, and wartime memories fade, an ancestor's military registration record, limited to the most basic of vital information, may be the only evidence of his service to his country. While genealogists highlight marriages, births, and family lines in their research, military service is often incidental -- a footnote annotation in a charted family tree. When I initially researched my own family history, I found elaborate details related to my ancestors' marriages, births, and deaths, but noted only a cursory mention of their military careers. At a recent memorial service for my husband's paternal uncle, we had the opportunity to witness the presentation of an American flag by an Honor Guard, a stunning tribute to my husband's “Uncle Ed” and his service to his country. At Ed's viewing, there were many stories shared about his love of family, his devotion to his real-estate career, his ability to organize community events, and put people at ease, but little was said about his military service. As he was laid to rest, and an American flag, folded into the shape of a three-cornered hat, was presented by the Honor Guard to surviving family, all in attendance were at once reminded that Ed had enlisted in the the military during World War II, and were deeply moved. Ed's World War II enlistment record offers an abbreviated view of a high school graduate with machine-shop training, a single man with dependents, who were his immediate family. Challenged to complete Ed's story of service, I searched the 1930 Federal Census records and discovered that Ed was, in fact, the youngest in a family of eight, that his mother and father were originally from Poland. I examined the census reports of adjacent households in Trenton, New Jersey's sixth ward, observed numbers of Czechoslovakian and Polish surnames in close proximity, and concluded that Ed lived in a tightly-knit, Eastern European immigrant community. I browsed the recently published 1940 Federal Census and unearthed the roots of Ed's (and my husband's) deeply ingrained work-ethic, for according to the enumerator, Ed's three elder brothers all contributed to the household, and each held a job – as, respectively, a night-club musician, a factory-worker, and my father-in-law was, at the time of the1940 Federal Census, an apprentice linoleum layer for a department store. According to the census taker, Polish was the language most commonly spoken at home in Ed's neighborhood..
A 1941 parish directory was shared at Ed's memorial service, its pages lined with the photographs of young men in uniform, their faces full of hope, eyes bright and shining. Leafing through the directory, I was reminded that while most view senior year as a launching point for college and careers, for a high school graduating class in the early 1940s, senior year was a weigh-station on a long and perilous journey – one that for many would end on foreign shores. From a published obituary, I learned that Ed was an Air Force veteran of World War II, who served in the Asiatic Pacific campaign. After returning home, Ed approached life with boundless optimism -- that he, as a survivor of World War II, had the opportunity to marry, buy a home, build a career, educate his children, and be of help to his family and friends ranked highest among his concerns. A lover of music and song, and a devoted family man, Ed didn't “sweat the small stuff.” Quibbling over trivial and insignificant events of the day simply didn't factor into Ed's priorities – nor did quibbling factor into his brother's priorities, as I recall, and certainly my husband is not a quibbler..
By extending my research beyond a single military registration record, to include the 1930 and 1940 Federal Census, newspaper articles, and other published sources, I gained insight into a family's shared traits, uncovered the greater reality that upheld “Uncle Ed's” military enlistment record, and, in honor of Memorial Day, advanced one enlisted man's story of service from footnote to front-and-center. 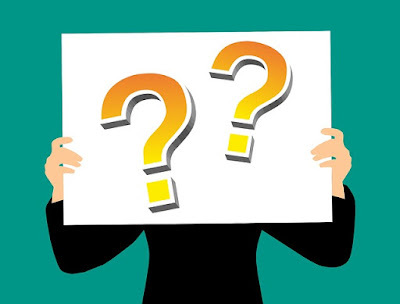 Davida asked Olive Tree Genealogy an interesting question and one that I think is asked by many newcomers to genealogy. In the 1870 census, I found 14 males with the name Blake in St Peters, Beaufort, SC. My question is could it be that these males were related. I realize that it's kind of hard to tell just from census records but being that there are such few of them, I thought that maybe the older men were possibly brothers who had sons and those sons had sons. * The older men could be cousins. * The men could be from unrelated Blake families. * They could be related but much further back than brothers or first cousins. Adding your guess to the mix we see that we have four good possibilities. So let's simplify it. Your job as a genealogist is to find evidence that supports your guess (older men are brothers) or disproves it. You can start by listing the family groups you know from the 1870 census. Then search 1860 and 1850 census records to see if you can fit more of the men into proven families. Look for other records that will help you straighten out those Blake males. Church records for baptisms, marriages or deaths. Obituaries in newspapers. These are only a few of the record sources you should try next. The most important piece of advice I can give is to NOT make assumptions! Create working theories if you like, such as your guess that the older men could be brothers. That can be your working theory. But don't assume it's correct. Work to prove or disprove it. If it turns out to be correct, pat yourself on the back and continue on. If it turns out to be wrong, form a new working theory and go from there. It's okay to guess. It's okay to form a theory. But after you've formulated a guess or theory, you have to look for evidence that supports it. Because good Genealogy is based on facts and evidence, not guesses or unproven theories. This Victoria Day Weekend Ancestry.ca is offering 200 million historical immigration records from around the world for free, until May 21st. Immigration and travel records tell the story of your ancestors as they made the courageous decision to immigrate, travel or become a citizen of a new country. With 200 million immigration records from Canada, United Kingdom, the U.S. and several other countries from around the world at your disposal, you may uncover the answers you’ve been looking for. Explore passenger lists, naturalization records, border crossings, crew lists, immigration and emigration books, passports and more as you discover your family’s journey to Canada. The story of your ancestors’ journey to a new country is waiting to be uncovered. Search Ancestry.ca international immigration records for free, this Victoria Day Weekend only until May 21st. These states join Colorado, Delaware, Kansas, New Hampshire, Oregon, and Virginia as part of the quickly-growing 1940 census index. Recently my youngest son was given a photo of his grandfather Jack with Jack's parents. That doesn't sound too exciting but it is. No one in the family knew much about Jack's parents. All we knew was that Jack's father was either Otto or Oscar Schulze and his mom was Harriet. Years ago I asked my son's father to ask his mother about the Schulze family. Since she divorced Jack in the 50's we weren't sure how accurate or even truthful her answers would be, but it was better than nothing. Jack was long dead and there was no one else to ask. All she could remember was the surname Dewhurst and she wasn't sure if that was Harriet or someone else. So my hunt began. We knew the family was from Germany originally but settled in Yorkshire England at some point. Searching the online records wasn't as simple as I thought it would be and I couldn't be sure if I had the right man since we weren't even sure if his name was Otto Oscar or Oscar Otto. The family lore was that Jack, whose name was Jack Otto, had been given the middle name Otto after his father's first name. And that this was a tradition in the family so if Jack's father's middle name was Oscar, that meant the next generation back was a man named Oscar (something) Schulze. Then I remembered a small stationary box that my father-in-law Jack had in his possession when he died. We'd put it in the attic and of course forgot all about it. Inside I found the death certificate for his father. Question One answered - his father's name was Oscar Otto Schulze and he died in 1942 at the age of 58. Armed with an approximate birth year I was able to trace Oscar and find his parents, as well as his marriage to Harriet Dewhirst in 1908. We've never connected with any other researchers. Oscar and Harriet had only one child - my father-in-law Jack. Oscar was one of nine siblings born to Henry George Schulze and his wife Mary, but I haven't found anyone else descended from any of them. So it was a thrill for my son to be given this photograph which shows Oscar Otto Schulze (1884-1942) and Harriet Dewhirst (1887-?) The families lived in Halifax, Yorkshire England and my next quest is to hopefully find Harriet's death and send for her certificate. Slowly but surely we are putting together my son's paternal lineage for him and his children. Since his father died when my son was only 13, this is a very meaningful journey. And this photo brings his ancestors closer, giving a face to what was just a name and a few dates. This is another Tribute for a Canadian soldier. 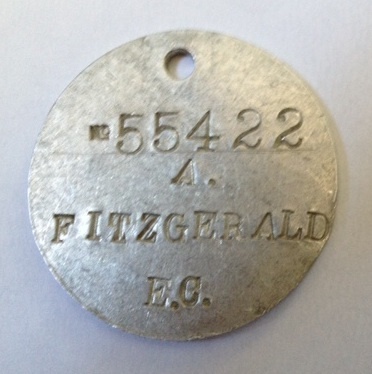 His name and service number are given on the front of his WW1 ID Tag - A. Fitzgerald, Service Number 55422. This tag is made of aluminum and we know it was issued early in the War. Aluminum was expensive and at some point tags were made out of a pressed material which was between paper and cardboard in feel. We do not know the meaning of the two letters at the bottom - E. C./G. 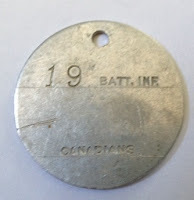 The reverse of this tag shows the soldier's unit (19 Batt. Inf. 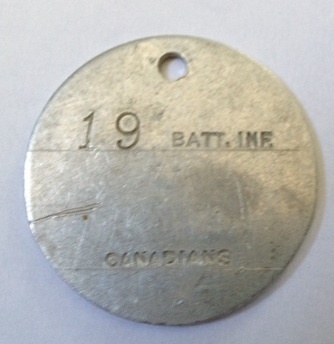 which stands for 19th Infantry Battalion) and at the bottom the word Canadian is stamped. This designated which country a soldier's unit was in. Who was A. Fitzgerald? Did he survive the War? Our curiousity was piqued and research begun. First stop was the online CEF database. 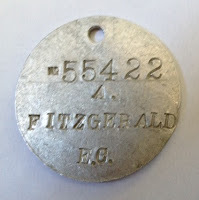 Using the service or regimental number provided on the tag, we found the Attestation papers for Arthur Fitzgerald born in Eastbourne, Sussex England on 12 November 1891. 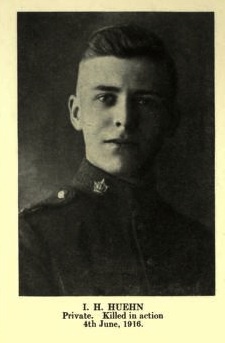 Interestingly Arthur enlisted in 1914 on his 23rd birthday. I next went to Ancestry.com to search census records and ships passenger lists. I was curious when Arthur came to Canada. Unfortunately nothing conclusive turned up in either set of records. I did find one marriage record which might be Arthur's. The marriage took place in Toronto in September 1919 between Arthur Maurice Fitzgerald born England, age 28 and Berna Wilhelmina Guest. Arthur is named as the son of Charles John Oswald Fitzgerald and Alice Fitzgerald. There are several online family trees which indicate this is indeed the correct Arthur whose WW1 ID Tag we have. One tree shows Arthur as dying in Toronto in 1968. Lady Alice was the daughter of a Marquis, Charles Fitzgerald. I have no other information on Arthur. Season 3 of Who Do You Think You Are? 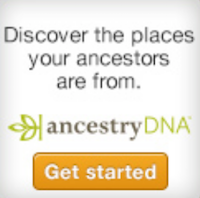 sponsored by Ancestry.com will be the last Season. NBC announced that it has cancelled the popular genealogy show for next year. I'll miss the show but it had a good run! Considering the small niche market I think the decision to not run another season was understandable. Labels: Ancestry.com, NBC, Press Release, WDYTYA, Who Do You Think You Are? A fellow blogger, Amy Coffin of WeTree Blog, wrote an article about her blog being included in Australia's Inside History Magazine's top 50 genealogy blogs. I went to Amy's blog to congratulate her, then headed off to see what other blogs made it to the list. I'm always looking for new genealogy blogs to follow. Jill Ball, another fellow blogger whom I met at RootsTech 2010 wrote the article called "Entering the Blogosphere" which lists 50 top genealogy blogs organized by topic. I did discover some blogs listed that I wasn't familiar with, so that was great. But much to my surprise, I also found my own Olive Tree Genealogy blog listed in the Top 50! I'm in the category of "must reads from overseas" That makes sense since the magazine is Australian based. So thank you to Jill and Inside History Magazine for this honour! I'm thrilled to be included in such good company and especially pleased since Australia has a special meaning for me. My 2nd great grandmother Sarah Stead, nee Elvery headed to Australia from England to settle with her husband and four young children in 1867. Sadly the pregnant Sarah delivered her baby on board the ship and then died a few weeks later in quarantine in Sydney Harbour. She was only 32 years old. She's buried in the old Rookwood Cemetery in Sydney and the gravedigger was her husband's brother who lived in Sunny Corners. Sarah's husband William Stead left two of his children behind with his brother and sailed back to England with the other two (the baby died at 9 months old and is also buried in Australia). One of the children he brought back to England was my great-grandmother. In fact I wrote a 5-part blog series called Abandoned in Australia chronicling my journey to find out what happened to the two boys left behind, and what happened to Sarah and her baby. I also have many Simpson and Stead relatives in Australia, since my grandmother's brother and uncles settled there in the late 1800s. So you can see I have a strong emotional attachment to Australia. And being placed in the Top 50 Genealogy blogs means a lot to me. The following announcement was sent to Olive Tree Genealogy Blog and I'm off to take advantage of this offer. Hoping I can find my English grandmother. The 1911 Census is complete at Ancestry.co.uk. They've finished all the transcriptions, so you can search for your relatives just as you would in any of their other census records. Better yet, they've made the whole thing absolutely FREE 11-14th May! You'll also find extra columns not included on previous censuses. You can discover the industries people worked in, how long couples had been married, and how many children they'd had. This last point is particularly useful if you've found birth records that don't seem to tally with your existing discoveries. 1911 marked the end of an era, with the Industrial Revolution complete and World War I just three years away. The Census reveals whether your ancestors kept to tradition as butlers and maids, embraced change as miners or factory workers; or fought the system as suffragettes. This is the perfect chance to discover your recent relatives. Log in to Ancestry.co.uk to search the entire England & Wales 1911 Census for FREE. Search the 1911 Census now. Recently my son reconnected with an aunt on his father's side. Since his father passed away in 1993 there has been little contact with that side of the family. There was no estrangement it was simply due to time constraints and distance. When my son visited his aunt last weekend he had a chance to reconnect with cousins, and his aunt kindly showed him family photos and told him stories of his ancestors. She also gave him a beautiful gift of two brass racing dogs which were owned by Roland Hill, my son's great-grandfather. Roland was born in 1880 in Pontefract, Yorkshire England and died in 1943 in Halifax Yorkshire England. He apparently loved birds and owned many canaries which he kept in cages in the attic of his home. My son's aunt remembers her grandfather fondly and has told me many stories about him over the years. The two greyhound racing dogs sat in front of the fireplace for as long as my son's aunt can remember. Perhaps they were a wedding present at his marriage to Kate Wormald in 1905. The dogs have names stamped on their bases. One is Col. North's Fullerton and the other is Farndon Ferry. A Google search provided information that they were the winners of the famous Waterloo Cup, at the end of the 19th century. Fullerton, known as Col. North's Fullerton at the height of his success, won between 1889 and 1892. Farndon Ferry won the event in 1902. My son's aunt wanted him to have these brass fireplace dogs so that he could pass them on to one of his children (along with the story of who first owned them). And that is what I love about genealogy and family who care about family treasures. The dogs are on a new journey. 6 Indexed States for 1940 U.S. Census Now Available! Since April 2, Community Project volunteers have indexed more than 45 million records and this number continues to grow quickly as more than 10,000 volunteers sign up each week. Those interested in lending a hand can learn more and sign up to be an official 1940 U.S. census volunteer indexer at the 1940 census website (the1940census.com). The project will release searchable records for individual states on an ongoing basis with an aim to make the entire 1940 U.S. census searchable by the end of 2012. To learn more about the 1940 U.S. Census Community Project and to track real-time progress of volunteer indexing efforts, visit the1940census.com. Ira Harry Huehn was born 10 June 1895 in Toronto. He enlisted in the CEF (Canadian Expeditionary Force) on August 15, 1915 when he was just 20 years old. He gave his mother, Mrs. H. E. Huehn as his next-of-kin. He was a bank clerk and had served 3 months with the Queen's Own Rifles before enlisting. Ira was sent to the PPCLI (Princess Patricia's Canadian Light Infantry) which co-incidentally is the unit my youngest son served in as an infantry soldier from 2000-2005.
photo found by Annette F.
We have Ira's Death Medal, Silver Cross (see photo on left) and WW1 Medal. Ira's father died in October 1914 and his poor mother lost her husband and only son in a two year span. This blog post is meant as a tribute to Ira and all those who fight and have fought for our country. Sadly Ira's body was never recovered for burial. I often think of how his mother and sisters must have grieved, not only for the loss of Ira but thinking of how he was never laid to rest. Mariann asked Olive Tree Genealogy a great question about the accuracy of ages on census records. Do genealogists often find a lot of inaccurate ages (and projected birth years) on the US Census? I've been using ancestry.com, and relatives often seem to vary their stated ages (thus birth years) from one census to another. Then when I see a Death Certificate, the stated birth year sometimes doesn't agree with any of the census dates. There can be a variation of as many as 5 or 6 years. How do I know which date is the closest to accurate? 1. People often did not know exactly when they were born. There were no ID cards, credit cards, Driver's Licenses and so on in the 1800s and earlier. These are all items that require an exact date of birth and so it is imperative that we know when we were born. But before the 20th century it was not important. In fact I have a copy of a letter written in 1841 by my 2nd great grandfather Levi Peer asking his mother to check her Family Bible and tell him when he was born. 3. Different census years had different questions re ages. For example the question on age might be phrased as "Age at last birthday" or "Age at next birthday" or simply "Age" And of course the census taker might not ask the question as specified. Of course that won't give a 5 or 6 year variation in answers but it does account for some. 4. Women in particular often lied about their ages. Many individuals didn't trust the census or the census taker and would simply give whatever answer they felt like giving. So there you have four reasons why census ages can't be trusted. You mention Death Certificates not agreeing with census records and that's another problematic record. A Death Certificate has information that was not provided by the deceased! So depending on who the informant was and how much they knew about the deceased, the information provided can be completely inaccurate. I have a good example of a Death Certificate that is completely wrong but will, I'm sure, be accepted as accurate by researchers. My grandmother's 17 year old brother was the informant for their mother Mary Peer's death. He has given the wrong mother and father for his mother. Her parents were Isaac Vollick and Lydia Jamieson (this is proven with documents such as her marriage record and census records). But he has said her parents were Stephen Vollick and Mary. Such a discrepancy took me awhile to solve. Then I realized that in all likelihood, in his grief and confusion when the clerk asked him "Father's name" he gave his own father's name (Stephen). When asked "Mother's name" he gave his mother's name - Mary. Thus the entirely fictitious couple Stephen and Mary Vollick were created. Researchers finding that death certificate who have not yet found Mary's marriage record will have no idea that they are looking at completely erroneous information. The bottom line is that it is wise to study all records and determine their validity by looking at who gave the information contained in each record. So for example a death record or a gravestone for example may not be accurate because the person themselves did not provide the information. A birth record is considered quite accurate because the information is usually given by parents. But there's a caveat - if you are not looking at the original record there is a chance that errors crept in. Each generation of a record increases the chance of errors. You may want to read my article I Found My Great-Grandfather Online - Now What?? for more information on how much an original record can change. Just to make things more confusing, remember that individuals might lie for various reasons. That is why we should always gather as many records as possible for each individual. Calculate the trustworthiness of each one. Then study them as a group. Sometimes you have to be content with an estimated year for an event based on all the records you've found. But of course you should keep looking for a record that will give a first-person account of the event. In any record you should think about who provided the information. If it was not the individual then the accuracy is immediately in question. And even if it was the individual, did they know the answer? Did they lie? Genealogy research is never easy but analyzing records is part of the fun! Cindy asked Olive Tree Genealogy a question about her Irish ancestors' immigration to Canada. thank you in advance for your time, I am trying to find my husbands family. http://trees.ancestry.com/tree/25599501/person/1678863353 Robert Moynan born 1821 in Ireland and his wife also from Ireland lived in Farnham and is buried there along with his wife. I am looking for records of emmigration but find nothing. I do know that some records from Ireland are missing and I don't know if they came as "Poor" any ideas? Hi Cindy - I see from your online tree that the family were in Quebec before 1851 when their daughter was born. That's a challenge because prior to 1865 ships passenger lists for Canada did not have to be kept. So finding one is tricky. Some have survived but most have not. Don't despair though as there are substitutes to finding an actual passenger list, such as shipping company records, Emigration Agent records, Steamship records from ships taking immigrants up the St. Lawrence River, etc. But first you might want to try to narrow your timeline for their immigration. Have you checked the online Lower Canada Land Petitions to see if Robert petitioned for land? When you are ready to begin your immigration search, Filling in the Gaps has a comprehensive list of all passenger lists and substitutes for ships passenger lists to Canada before 1865. Each one is linked to an online database. The one exception is the 1831-1865 records from the Hawke papers which are not online but can be consulted at the Ontario Archives. Hawke was an emigration agent who kept records of arriving passengers. However the James Allison papers (another emigration agent) are available online or as a lookup from 1823 to 1845. Great news! Flip-Pal has kindly given Olive Tree Genealogy an exclusive offer for my readers! This offer features the NEW Digital Creativity Suite from Flip-Pal. You all know how much I love my Flip-Pal Mobile Scanner. I can't say enough good things about it. So I'm thrilled that Flip-Pal decided Olive Tree Genealogy Blog readers deserved a special offer. Coupon is good from May 4 through May 11 or while supplies last! Flip-Pal mobile scanner with Digital Creativity Suite 3.0 DVD ($209.99) is for those who are looking to enhance photos and create logos as works of art. It has great software to make professional-looking projects at home and then share your creativity with your friends and family. This product is for PC and Mac users.